Preschool Number Play: Countless Benefits! It might be surprising to know that it is important for preschoolers to learn about math. Children’s math skills at kindergarten entry have been found to best predict their later school achievement. Research has also shown that children’s early math play contributes to their math achievement and attitudes toward math in later schooling. “Early math” references a broad area of child development. Of early math skills, numeracy is arguably the most important area for kindergarten preparation and is one of the main areas that families can work on at home. 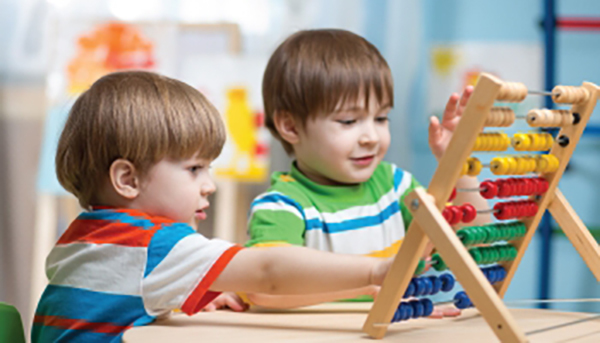 To develop early numeracy skills, preschoolers need to learn about numbers. This could look like counting out loud in the right order, counting objects one at a time, finding and naming the number symbols, comparing and estimating amounts, and understanding ‘how many’ objects there are total. The state of Washington has guidelines that outline, by age, important early math skills, including preschool numeracy (pgs. 64, 78, 93). Engaging in intentional number play with your child can help them to learn numeracy skills and get excited about learning more! Research shows that number play is more effective for a child’s skill-building when an adult guides the play. • How many ____ are there? • What number is this? • Can you count up to the number you see on the page? • Let’s count all the ___. • Find the number ___. • Match a verbal number with objects (i.r., find 5___ ). • Simplify the board game to only focus on number play. • Add number stickers to board games that only have color spaces. • For younger learners, start with a limited set of numbers (e.g., 1-3 or 0-5). • Play on board games that have straight pathways rather than circular pathways. This makes it easier for children to learn number order. • Ask your child to count up from their current number spot. For example, if your child is on space “3” and they spin a 2, ask them to count “4, 5” as they move to their new spot. • Incorporate math-targeted questions (see above). Your family can play dice or dominoes and ask about comparing quantities (e.g., “Who has more?”) or play bingo, cards, or UNO to identify number symbols and connect to number names. • Meal times with counting and comparing amounts of treats or walks in the park searching for certain numbers of animals or plants. • Your home environment with identifying and naming numbers (e.g., calendars, appliances, clocks, etc. ), the store (e.g., prices) or in the car (e.g. road signs). • Songs, rhymes, and hand games including learning the order of counting aloud and matching finger/sound amounts to number names. • Outdoor play such as the game “What time is it Mr. Fox?,” which matches the number said to the amount of steps taken. • Pretend play, like dolls or vacation, and asking questions about counting objects, total amounts, comparing quantities, sorting amounts by least to most and simple operations (e.g., sharing food equally between 3 dolls at a picnic). It is important for caregivers to model, or use examples of “math number talk,” through narrating play. Provide opportunities for children to answer numeracy questions and use “math number talk” too. Attending STEM events is another way to change up early numeracy learning and have hands-on play.Check out Imagine Children’s Museum’s Little Science Lab for engaging classes where preschoolers and their grownups can practice categorizing, playing with numbers and drawing conclusions. These free classes are available in Spanish and English. Learning through adult-child play can be a fun and meaningful way to develop key early numeracy skills! This entry was posted in Milestones & Learning on March 7, 2019 by admin.